Dr. Mark Kroll, UTRGV Robert C. Vackar College of Business & Entrepreneurship Dean, speaks during the Border Economic Development and Entrepreneurship Symposium (BEDES) hosted by UTRGV, the Federal Reserve Bank of Dallas, San Antonio Branch, and the McAllen Chamber of Commerce on Friday, Dec. 1, 2017 at the Embassy Suites in McAllen, Texas. BROWNSVILLE — After seven years as dean of the University of Texas at Brownsville School of Business and then the UT Rio Grande Valley Robert C. Vackar College of Business and Entrepreneurship, Mark Kroll is stepping down as of Aug. 31. In an interview Thursday, the Harlingen native said he has enjoyed being dean but felt the urge to return to faculty and focus on teaching, research and publishing. Kroll said a big slice of his 30 years in higher education has been devoted to publishing and research. Kroll said there’s a good chance he’ll travel to Singapore next year for a yearlong visiting professorship. In 2009, he spent a year as a visiting professor at the NanYang Technological University there. Kroll described Singapore as a beautiful, ultramodern city. 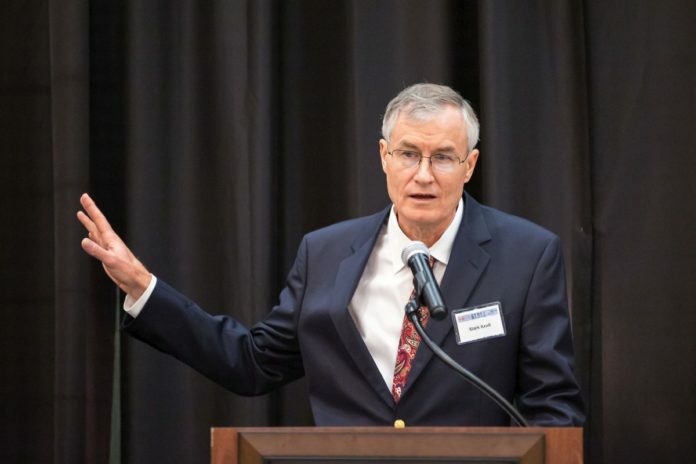 Kroll said he likes to think he helped accomplish some things as dean, including getting first the UTB business school, then the merged UTB and UT Pan American business schools, accredited by the Association to Advance Collegiate Schools of Business, the international accrediting body for college business schools. When he took the helm as dean seven years ago, it was made clear that accreditation was a top priority for UTB administration, Kroll said. Kroll said he’s also proud of his role in merging the two business schools — successfully, he believes — and also cited the $15 million Robert C. Vackar scholarship endowment in 2016 as a significant milestone for the university. Asked to predict Brownsville’s and the Rio Grande Valley’s economic future, Kroll said as long as the county avoids another economic meltdown ala 2009, and “if we can get NAFTA done right,” he foresees more manufacturing operations like Cardone Industries coming in. Cardone, a large automobile-part remanufacturer that supplies all major U.S. parts retailers, has operations in Brownsville, Harlingen and Matamoros, and this month announced plans for a new distribution center in Harlingen. Kroll also cited a new Black & Decker manufacturing plant announced for Mission. He thinks such companies are looking for a relatively young workforce and relatively inexpensive, plentiful real estate — in short supply in economically prosperous parts of the country such as California. The advanced manufacturers the Valley wants to attract don’t necessarily need employees with four-year degrees, but rather people with “midrange skill sets” such as machinists, tool-and-die makers and workers with computational skills, he said.